I’d planned to post a short and sweet blog entry about my mom and Mother’s Day and maybe what we did here in Bethesda for the day. 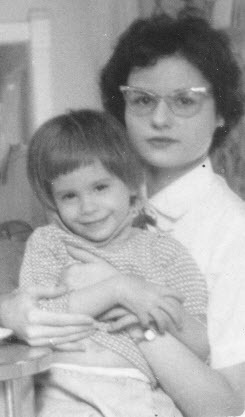 I was going to post a photo of my mom and me when I was about 4. Then I was going to talk about how we went to Lilit today for lunch and how I asked for nothing for Mother’s Day except for Andrew and Dean to get some columbine from Bob’s no-lawn garden because he invited me to take some. Then I may have told about the rest of the day and how Clare called asking if we’d take care of her roommate’s calico cat while the roommate was in New Orleans for the summer and how I wanted to shout “YES!” because I like calicos, but had to discuss it with Dean (who said yes, but as long as we’re Plan B). Yes, I was all set to have a selfish Mother’s Day until my neighbor Amy told Dean (who told me) that another neighbor, Jerry, died suddenly while on a road trip to pick up his daughter from college. I didn’t know Jerry well — he served on the Board of Directors for our neighborhood and his wife is the community liaison between our neighborhood and NIH. Whenever I saw Jerry we’d always speak — usually about our children, sometimes about the Midwest (Jerry was from Wisconsin). He was always very easy to talk to — probably the Midwest influence. Jerry was our age and doing a something that we’re about to do in a week — picking up a child from college. I know people die in their mid-fifties. It used to happen more often, but it still happens. Life is brief — I’m pissed at myself for forgetting that until something like this happens. I need to follow Indigo Bunting’s lead and tell my husband that I love him when he leaves in the morning. Or just tell him I love him. Period. Do it. Tell him you love him. And on IB’s post, I’ve told all my blogging friends (that includes you) that I love you too! Making me tear up again. Lovely. And, an aside. I love how you told us the stuff you were gonna tell us. Nicely done. Even though I know life is short, it takes stories like this to make me KNOW it. Thank you. Sad…but what a sweet picture. You still look like that. And I love your mom’s glasses!